Tersky Rayon stretches along the White Sea coast. Once the whole Kola Peninsula was called Tersky (or otherwise Turiy, what means "forest"). Hence Tersky Coast means Forest coast. 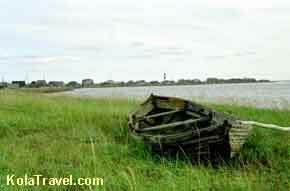 Today the name Tersky Coast refers to a section of the coast from Cape Svyatoy Nos down to the Varzuga River mouth (the locals consider it stretching as far as to the Turiy Peninsula. 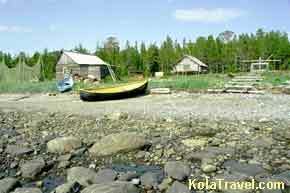 Russian settlers began opening up the Kola Peninsula during the 12th century. The need for fresh fishing and hunting grounds brought them north to the shores of the White Sea, where they little by little put down their roots. The remote location and harsh northern conditions forced these Pomors - as they became known - to be extremely self-reliant. Their homesteads consisted not only of sturdy log homes, but also saunas, storehouses (on piles for protection from animals), ice-block freezers, and special devices for dragging their wide heavy wooden boats – known as barkas – onto shore. Over time the Pomors developed their own unique architectural style.